Home Writing	Who Should Make Decisions? 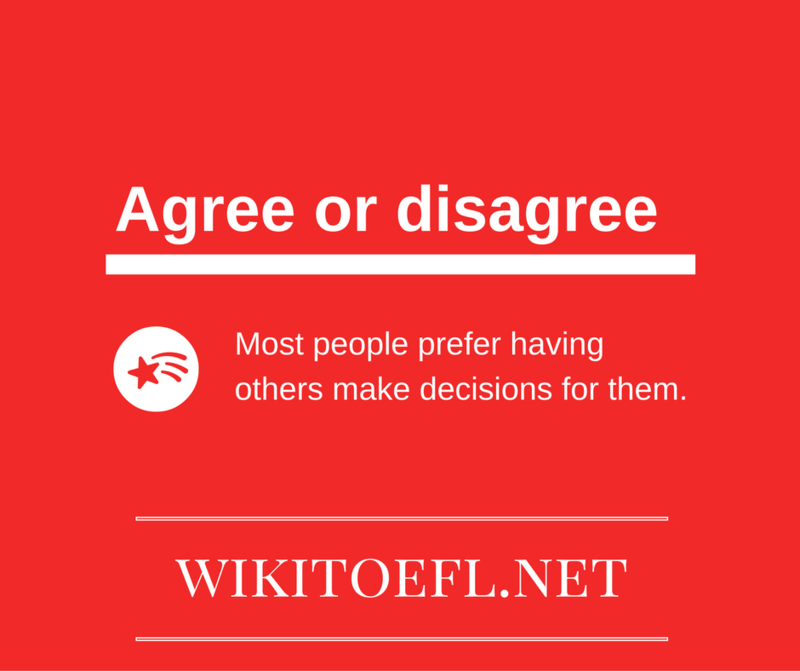 Most people prefer having others make decisions for them. Some time ago, I saw a television news report stating that the majority of people wanted others to make their decisions for them. I cannot believe this report was correct. In my experience, most people prefer to make every decision for themselves. Most people want to feel like they are in control of their lives. This means they want to make their own decisions. It does not matter if the decisions are big or small. People would simply prefer to make them for themselves. Otherwise, they will appear to have no power over their own lives. My brother, sister, and I hate when our parents tell us what to do. It makes us feel powerless. Of course, our parents have our best interests in mind. And many times, we would make the same choices that our parents did. However, we would feel much better if we, not our parents, could make those choices. It is all about being independent or being dependent. Another reason people like to make their own decisions is that they often feel they know what to do better than others. Therefore, they want to make the choices that will determine their own lives. Since many people have big egos, they often think they are smarter than others. Naturally, they believe their choices are better than those anyone else would make. My father is a perfect example of this. He never listens to anyone’s advice but always does what he wants to do. His decisions are usually fine. Of course, sometimes he makes bad mistakes. But he does not mind because he still thinks his choices—good or bad—are better than those of others. In conclusion, most people want to make their own decisions. They like to be in control, and they consider their decisions to be the best ones. I feel the same way. In essence, who likes others telling him or her what to do?